One of the best nights I've ever had in my life was at the Waterslide/PopKid show at a club called What's Up in Uguisudani. I met many wonderful people and saw four very excellent bands play. One of the bands was called 2 Sick Worry. They were quite great, but they don't have any records out yet. 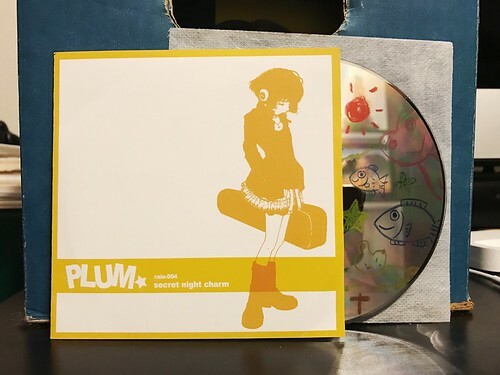 However the singer from 2 Sick Worry gave me this Plum CD as it was the band he had been in previously. No surprise, this is great too. Immediately I'm drawn to make comparisons to Navel because of the excellent, high pitch vocals. Nice and melodic, in the liner notes they are listed as 'chirps' and I can see where that would come in as a description. Musically, they stray away from Navel's more traditional pop punk sound and have more in common with bands like The Scaries or Delay. Jangly, treble heavy guitars belting out big hooks. When I was in Tokyo I really felt like I was interacting with the music scene that I should have been in all along. Even though I've been listening to a lot of Japanese bands over the past twenty years or so, there was another new one every time I turned around. I didn't see Plum play and I didn't see this record at any of the record stores I went to, but out of the kindness of someone's heart it was given to me, just because it was thought that I might like it. That's the kind of scene I want to be part of. Secret Night Charm is a killer record and I can't wait to hear from 2 Sick Worry. As good as Plum were, 2 Sick Worry was even better when I saw them play.